“A Trout Fisherman’s Soul” by Tony Dincau is an introspective look at a family fishing trip. The trip is described in almost excruciating detail, but the book is far more than a memoir of a family vacation. It is one man’s effort to bond with his son and nephew, re-bond with his brother, and reminisce about his father and grandfather – all of whom have taken the same fishing trip at one time or another. The author’s father and grandfather had long since passed on, but his fishing trips with them on the Flag River in Wisconsin remained some of his fondest memories. The fishing was, of course, a major part of the memories. But more so was the experiences shared by grandfather, father, and son. 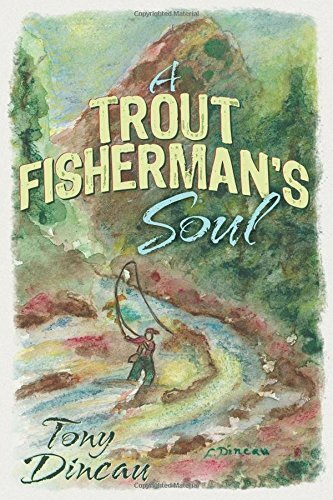 The trip chronicled in “A Trout Fisherman’s Soul” was the author’s effort to instill the same connection – to family and nature – in his own young son. Dincau faced a daunting task in “A Trout Fisherman’s Soul,” and that is taking an intensely personal experience and presenting it in a way that may be shared by a stranger. Writing such a book may be therapeutic for the author but not necessarily of interest to a reader. One may recall the peculiar wit or peculiarities of a family member with fondness, but such humor and quirks do not easily translate on the written page. Despite these difficulties and limitations, in “A Trout Fisherman’s Soul” Tony Dincau does an admirable job in articulating his attachments to his father and grandfather, gained in large part during their many trips on the Flag River, and expressing his desire to pass the same feelings onto his son. These are indeed emotions shared by us all.